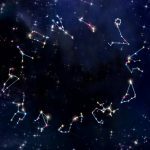 Do you know your North Node and how to work with it? If you have no idea of what we are talking about, now it is time to find out. Lunar Nodes are important aspects of our birth chart but people usually do not talk about them. In this article, we will tell you everything you need to know. Stay with us! To start talking about North Node, first we need to clarify what Lunar Nodes are. Lunar Nodes are aspects that scholars of Kabbalah and Karmic Astrology put a lot of focus on. They are also called “Dragon’s Head” and “Dragon’s Tail” and carry some information about our past and our future. Lunar Nodes are imaginary points in the sky and calculated from the intersection of the arc of the Sun and the Moon. Since the cycle of the Moon takes about a month and the cycle of the Sun a year (in fact, the Earth cycle around the Sun), it is common for people of the same age to have the same Lunar Nodes. Once you have discovered the North Node, you automatically know your South Node because the points are in exactly opposite directions. If you have North Node in Aries, you have South Node in Libra and so on. You can look for a symbol that reminds the symbol of Leo at your birth chart to find out yours. As we said, Lunar Nodes are important aspects because they give us a path to follow in the life we experience at the moment. The North and South Node serve contrary energies that must be worked on if we want to evolve during our existence. As the name itself says, South Node means what is behind and North Node what is in front of us. In Karmic terms, South Node would be what we were in past lives and North Node what we should be today and tomorrow. The relation between the Nodes is very close. If you have North Node in Aries, it means that in past lives you had Libra’s characteristics that were not well worked on in past lives. So now you need to find an aspect of Aries that will balance this flaw of Libra. The North Node represents in a positive way what we should stand for in this life. Once you find out yours, take this opportunity to gain awareness of your mission and to develop some aspects you might be in need. At first, you can feel a little bit of discomfort, like every important change does. But once you manage that, you will feel that your life has a stronger purpose now. You want to feel free but this will only happen when you do not rely on anyone to feel ok. Aries is the sign of independence and bravery even when it is alone. They disagree when they need and do not care about what others think about them. It is time to focus on you as an individual. North Node in Taurus wants to tell you that you do not need to take things so personally. If somebody tries to pull you down, you must to stay strong and pass above it. Try to have a more practical look at life. South Node in Sagittarius made you believe that you, only you, were right in past lives. Although you loved to learn, you might have been full of it, not letting space to other people speak. Gemini wants to teach you to not take things too seriously. North Node in Cancer suggests that you can live with your emotions now. The time of being a machine is in the past now with South Node in Capricorn. You do not need to have everything in control to be happy and loved. If you needed to put yourself aside in past lives, now it is your time to shine. Your challenge is to accept that you can and should be loved and appreciated. To worry about others is beautiful but to stay alive you need to take care of you too. You were a dreamer. It is good to have happy thoughts and to dream with a perfect world, but nothing happens if you do not take action. Virgo comes in your North Node to show that you need to take things seriously and with responsibility. If you always wanted to do everything alone and did not think you needed help, Libra comes to show you that we can learn from others influence in our lives. Respect and diplomacy are challenges that you must conquer. Scorpio comes to bring what Taurus fears the most: change. If you dedicate yourself to develop the ability to look into your heart, suffering and reborning a new person that Scorpio has, you will feel that being linked to what is inside you is much more gratifying than material things. There are two signs that love social contact. The difference is that Sagittarius seeks deeper connections. Gemini made you too superficial and interested in gossips in the past. Now you need to dig more and relate to other people’s journey with true empathy. It is time to be a grown-up woman (or man). South Node in Cancer detects that you had a childish attitude and were too attached to memories in past lives. Capricorn urges you to be more reasonable and practical in this life. You were “I” and now you need to learn how to be “us”. Leo is a sign very turned into “myself” and Aquarius comes to teach important values for the society like solidarity, humanity and equality. Focus on developing friendship and relations to all kinds of people. In your past life, you were so skeptical that in this one you needed to have North Node in Pisces. Pisces is the sign of belief. They believe there is a lot upon us and are always trying to find a connection with the Divine. Do not be so perfectionist and attached to details, try to relax and be more surrendered instead.